Power management - a feature enabling to use modes and technologies lowering the power consumption or turning off components in the computer. For desktop computers the lower power consumption means lower costs, for portable devices it is a key element for extending the battery life. It is ideal to let the computer, if you are not working on it at the time, turned off, hibernating or sleeping, and if you want to activate it, it is ideal if the computer is immediately prepared for working in several seconds, not only by pressing a button or key. The computer can be woke up by various events that require user attention, for example a requirement from the network, received email, fax, application start up at a set time or other events. HW and SW support of power management - if some components are not being used at the moment, they will be turned off or switched to the low-power state. Lower Micron Process Technology and input - new technologies and progress are bringing smaller components, advanced parameters, lowering the heat and in portable devices extension of battery runtime. Power-saving modes of the processor - in order to extend the battery life, there are special processors and technologies being put into portable computers. These are able to, in combination with other components and SW support, optimize the performance of the processor, taking into account maximum energy saving, even if a little of the performance is lost. The AMD company developed power-saving features for mobile processors under the name PowerNow!, similar to the SpeedStep™ Technology by Intel. Lesser known but supported technology is LongRun® by Transmeta represented in the Crusoe™ processor. Microsoft in the OnNow initiative, together with support of some functions from ACPI, version 2, implements the Processor Performance Control function into Windows XP and Windows 2003 Server. In short, this function is defined as processor performance control for effective utilization of performance modes of the processor. The performance modes are different stages of the processor, depending on the CPU load and affecting the total performance of the processor and the energy consumption. Details you can find on the Microsoft's sites and in the document called Windows Native Processor Performance Control. Hardware - BIOS, motherboard and other HW support of APM or ACPI. Software - the operating system contains drivers and support for power management. The applications are able, in cooperation with the system, wake up the computer (e. g. fax software) or prevent from sleeping (Microsoft PowerPoint and using portable computer for presentations). User - if correctly understood and used, the power management can largely extend the battery runtime. The power management in portable devices and in common PCs is not only about saving power. When comparing Windows 9x and Windows 2000, the user finds out that longer time is needed for the start of the W2K system. Many users do not know about the way of making the start faster and getting other advantages thanks the power management. Everything depends on the way of turning off and on the settings. When you press the Shut down button in the Start menu, the classical shut down menu is displayed. 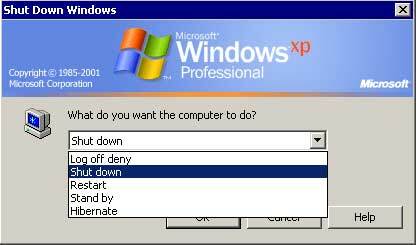 Everybody knows this menu - shut down, log off and restart - but the stand by mode and the hibernate mode are much lesser known. The computer turns off the monitor and the disk, and so largely lowers the power consumption. When the user comes to the computer, just one move with the mouse or a push on any key on the keyboard will return the user to Windows. This mode is designated for shorter breaks. Computer positioned in this mode is sleeping and the current unfinished work is stored in the operating memory that is, together with several basic components on the motherboard, under power. When the power is cut off, data are lost. There exist six ACPI modes denoted as S0 - S5. The Stand by mode is specified as S1, S2, S3. To specify which mode should be used, there are options in the BIOS system (usually S1 or S3). S1 Sleep State - Stand by (POS - Power On Suspend) a low wake latency sleeping state. In this state, no system context is lost (CPU or chip set) and hardware maintains all system context. S2 Sleep State - Stand by The S2 sleeping state is a low wake latency sleeping state. This state is similar to the S1 sleeping state except that the CPU and system cache context is lost (the OS is responsible for maintaining the caches and CPU context). S3 Sleep State - Stand by (STR - Suspend to Ram) Stand by (STR - Suspend to Ram) - The S3 sleeping state is a low wake latency sleeping state where all system context is lost except system memory. CPU, cache, and chip set context are lost in this state. Hardware maintains memory context and restores some CPU and L2 configuration context. S4 Sleep State - Hibernate The S4 sleeping state is the lowest power, longest wake latency sleeping state supported by ACPI. In order to reduce power to a minimum, it is assumed that the hardware platform has powered off all devices. Platform context is maintained. S5 Soft off The S5 state is similar to the S4 state except that the OS does not save any context. The system is in the “soft” off state and requires a complete boot when it wakes. Software uses a different state value to distinguish between the S5 state and the S4 state to allow for initial boot operations within the BIOS to distinguish whether or not the boot is going to wake from a saved memory image. In case there are some options missing in the shut down menu, then: 1. the computer does not support the power management mode. 2. some driver does not allow to use the saving modes. 3. Advanced power management is not turned on. Before the computer is turned off, the memory content is saved to the disk. When the computer is turned on again, it starts in the same stage at which it had been made sleep, so the user can immediately start working. It is not necessary to close applications and the start is up to a half faster than the common start! With this mode the hiberfil.sys file is connected. It is stored in the root directory of the system partition and it serves for storing the content of the operating memory. By turning off the hibernate mode and deleting this file you can get some space on the disk (64 and more MB, depending on the size of the operating memory). No energy is required after the computer is switched to the hibernate mode and when the power is cut off, data are not lost. Its disadvantage is longer time needed for turning off/on and consumption of the disk space. Measured values of time needed for turning on and off. The values can differ according to the SW and HW (RAM, CPU, HDD). According to OnNow it should be: 1. Classical start - less than 30s. 2. Return from the hibernate mode - lesser than 20s. 3. Return from the stand by mode - lesser than 5s. In case there are some options missing in the shut down menu, then: 1. the computer does not support the power management mode. 2. some driver does not allow to use the saving modes. 3. Hibernate mode support is not turned on. APM (Advanced Power Management) - older specification. The power management is executed by HW and BIOS system settings. Since 1998 it has been replacing by newer ACPI. The biggest problem is that there exist many types and versions of the BIOS system, differing according to the used HW and the developer. In comparison with ACPI, the support of stand by mode is often missing, computers with several processors are not supported and power management for IEEE 1394 and USB buses is also not supported. ACPI (Advanced Configuration and Power Interface) - specification for advanced configuration and power management, affecting Plug and Play functions and power management. Newly, by using ACPI you can use the power management by means of the operating system, without being dependent on the BIOS system (this function is known as OSPM - Operating System-Directed Power Management). The ACPI support is integrated in Windows 98/ME/2000 and higher. On the Internet, you can now find the specification for the version 2.0a (March 2002) developed in cooperation of Compaq, Intel, Microsoft, Phoenix and Toshiba. The document having 500 pages contains information about the key aspects and about saving modes. The main news of ACPI is advanced Plug and Play and assigning resources to particular devices (configuration information such as input and output addresses, IRQ numbers or DMA). Through Plug and Play in ACPI the IRQs are assigned/shared. Through an IRQ up to 250 virtual IRQs beginning with 16 are assigned. Advantage: you can connect several devices. Disadvantage: possible problem connected to new assigning, using of IRQs and impossibility to change the IRQs. OnNow Design Initiative - Microsoft's initiative. Specification for power management. It incorporates requirements on the operating system, device drivers, hardware and applications that must be integrated in the power management to improve the cooperation of particular PC components. Based on the ACPI specification and integrated in newer versions of Windows. Except reducing the energy consumption, a great emphasis is put on immediate work with the PC. instant-on (immediate turn on, immediate feedback) - feature designed for computers and peripherals (e. g. printers), it serves for reducing the time between turning on and starting the work. The key feature is a very fast return from the stand by mode to normal working mode (in computers it means that the computer is immediately prepared for the work, in printers it eliminates warming up time and enables almost immediate printing). Instant-on-Fuser - a technology developed by HP for printers. It eliminates the time needed for warming up laser printers and enables instant printing. HP claims that the first page will be printed in less than 15s. Disable using ACPI - on some computers the using of ACPI can be unwelcome. In this case disable the detection and installation of ACPI: 1. In the BIOS system deactivate ACPI. 2. Press the F5 key upon the installation start and set up the computer as Standard PC. 3. Press the F7 key upon displaying "If you want to install other SCSI or RAID drivers, press F6". 4. If you have copied the installation files from local or network disks, change the line ACPIEnable = 0 in the txsetup.sif file. Offered configuration options can differ according to the computer type (standard PC with APM, PC with ACPI, portable computer, PC using UPS). Power Schemes - you can choose a preset scheme for energy saving or you can create your own scheme and save it. Each scheme can contain different combination of saving modes. For each mode you can set up time of inactivity after that the mode is activated or you can completely deactivate the mode. In portable computers, you can set up the modes for power supply from the mains or from the batteries. Each scheme can be easily saved, added to the preset ones and later easily chosen from the list and set as active. Alarms - here you can set up limits for the battery (low battery alarm, critical battery alarm), set up action for the case an alarm occurs (e. g. switch the computer to the hibernate mode). Specify - here you can specify other features (displaying power supply icon, responds to power supply buttons). For portable computers, it is suitable to set up the icon to be displayed. In the right bottom corner of the taskbar you can easily find out if the power is supplied to the computer from batteries or from the mains. By clicking the right mouse button on the icon we will immediately see the battery status. Allow the computer to turn off this device to save power - enables to turn off a chosen device that is not being used. Allow this device to bring the computer out of standby - specifies if it is possible to turn on the computer by means of the chosen device. The command can be in a form of a signal from the network card, modem, web camera or other device responding to an event and bringing the computer to the active state. apmstat - a tool that you will find on the installation CD in the Support\Tools directory. You can install it by extracting from the file support.cab or by running the installation of support tools - the setup program. It serves for diagnostics when using APM. Scheduled Tasks - For each task you can set up to wake up the computer from the hibernate mode. It is convenient for executing some tasks at the time when nobody is working on the computer. Does my computer use ACPI or APM? Open the Device Manager and in the System Devices find out if there is the Microsoft ACPI-Compliant System device present. If it is there, then ACPI is being used. On non-ACPI computers based on APM will probably appear Standard PC. Correct functionality of APM is also indicated by NT APM support/Legacy (is displayed when hidden devices are allowed). Another indicating element is existence of the APM tab in the Power Options. If it is present, the APM is active, if not, the computer probably uses ACPI or there occurred some problems. Before start using or when some problems occur, it is suitable to check if all components meet the APM or the ACPI standards. Incorrect drivers or devices that are not APM-compliant or ACPI-complaint (most often older devices on the ISA bus) can cause problems resulting in difficulties with turning off or with using saving modes. VGA driver can be an example - until it is updated (a correct driver from the manufacturer), using of saving modes is not available. The computer does not turns off and there appears the message "Now you can turn off the computer" on the screen - the computer does not support power management or the power management is not enabled. In case of APM, check if the support of APM is enabled. If it is not enabled, try to enable it and check if the problem has been solved and if there are no problems when using APM. On computers where the system is not sure the APM will work without problems, the default setup is disabled APM. Enable the APM support in the Power Option. The APM tab is not present in the Power Options - 1. in computers with the power management it is overtaken by newer ACPI and the APM tab is not present. 2. "Switch to hibernate mode" is missing in the menu. Enable the hibernate mode support in the Power Options. The hibernate mode button cannot be highlighted - not enough space for saving the hiberfil.sys file. There appears following message upon installation: STOP: "The ACPI Bios in this system is not fully compliant to the specification" - during the installation no ACPI-compliant BIOS was detected. Get newer version of BIOS or disable ACPI. Users who use Windows 9X can also use Power management. But my personal experience with this is not good - many computers have problems with switching into hibernate mode or with waking up from the stand by mode or from the hibernate mode. Windows 2K/XP seem to be more reliable in this aspect, but if there are used some doubtful drivers or components, problems can also appear. In older computers, there can be problems with turning off - the problem is often in older type of BIOS and so an update is recommended. Correct setup of the Power management section in the BIOS system also plays an important role. Turn the computer off or not ? - in portable computer the turning off is important for saving the energy. In desktop computers it is not so necessary. It is argued that when the computer is often being turned on and off there arises surges that lower the life of the components. Advantage of turning off is reducing the power consumption, lowering the temperature in the computer and for many users also minimalization of the noise coming from the fans in the computer. In firms and when working longer time with the computer, it is usual not to turn the computer off and just to use saving modes or just to turn off the monitor. Servers and computer that provide some services (fax, disk space or just a shared printer) are usually not being turned off at all and so are the saving modes. Using screen savers - screen savers protect screens, but can disable using of saving modes and so it does not help to save energy. Extent of the power consumption - many users are not interested in this theme at all - the costs savings are not attractive, because this is usually important just for larger companies. So the theme of the extent of the power consumption and the energy input relates rather to choosing suitable power source and backup UPC sources. We cannot talk in general about the extent, because there exist various combinations of components in the computers. Standard installation - all options in the APM section are activated - the computer will be installed as ACPI Uniprocessor PC. Installation by pressing the F7 key - all options in the APM section are activated, the ACPI item is deactivated. The comptuer will be installed as a Standard PC. The hibernate mode will appear after installation of nVidia drivers. The APM is not available and the computer will not turn off. Installation by pressing the F7 key - all options in the APM section are activated. The computer will be installed as MPS Uniprocessor PC. The hibernate mode will appear after installation of nVidia drivers. The APM tab is not available and the computer will not turn off. apmstat: APM requires HAL support, this computer does not have that support. APM will not work on this computer, at all.